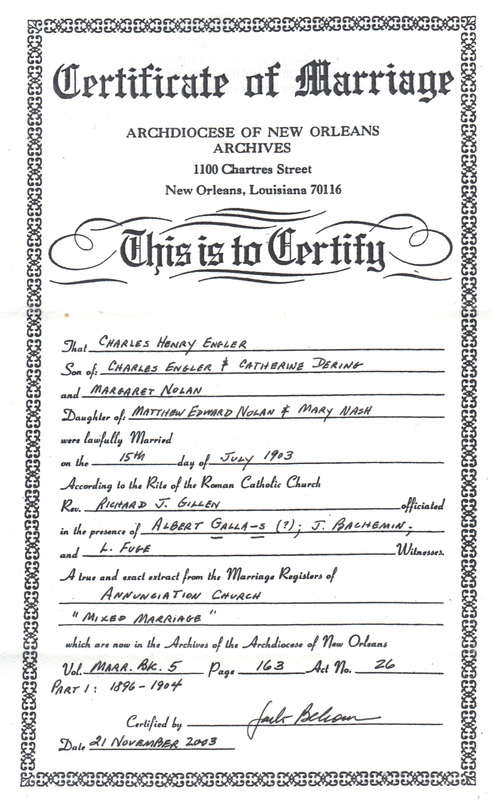 Ada Mayfield's father is listed as Wesley Mayfield on her Baptismal and Death Certificates, Wesley F. Mayfield on her Marriage Certificate and Frank Mayfield in her obituary. 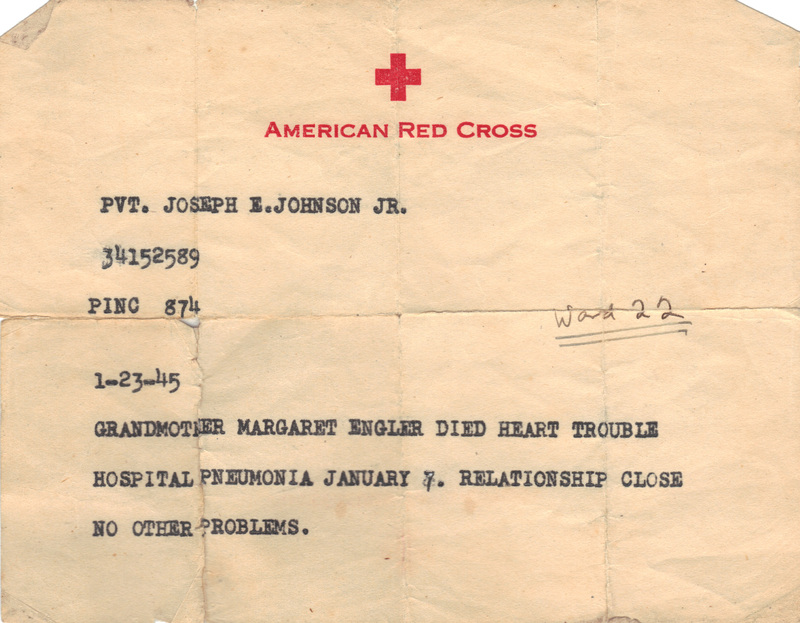 However to date, I have not been able to find record of his marriage to Margaret Nolan. 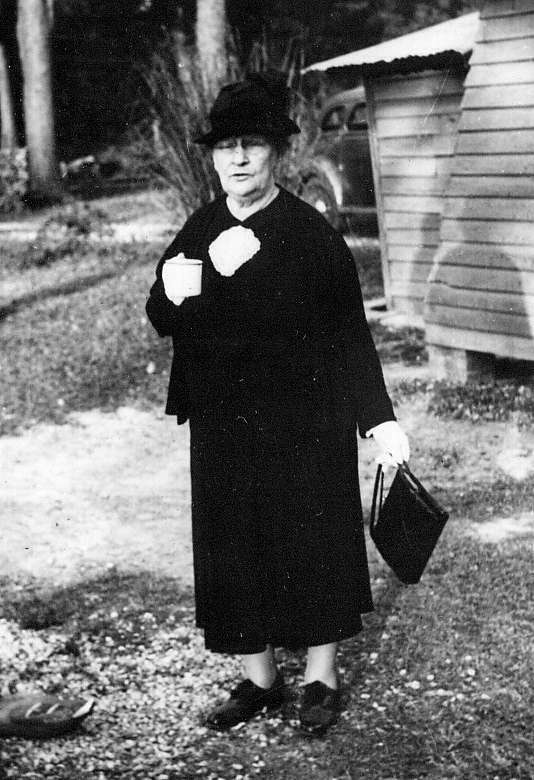 Margaret, the daughter of Matthew Edward Nolan and Mary Nash, was born December 17, 1864 in New Orleans, LA. She died January 7, 1945 (age 80) in New Orleans. 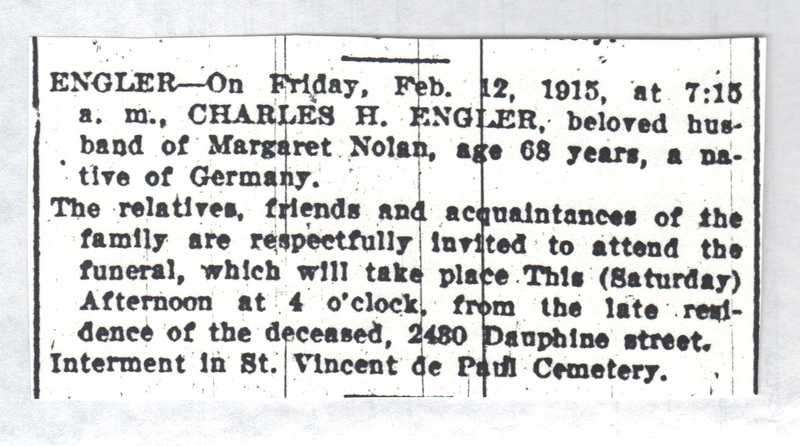 She remarried to Charles Henry Engler, a widower and native of Germany on July 15, 1903 in New Orleans. 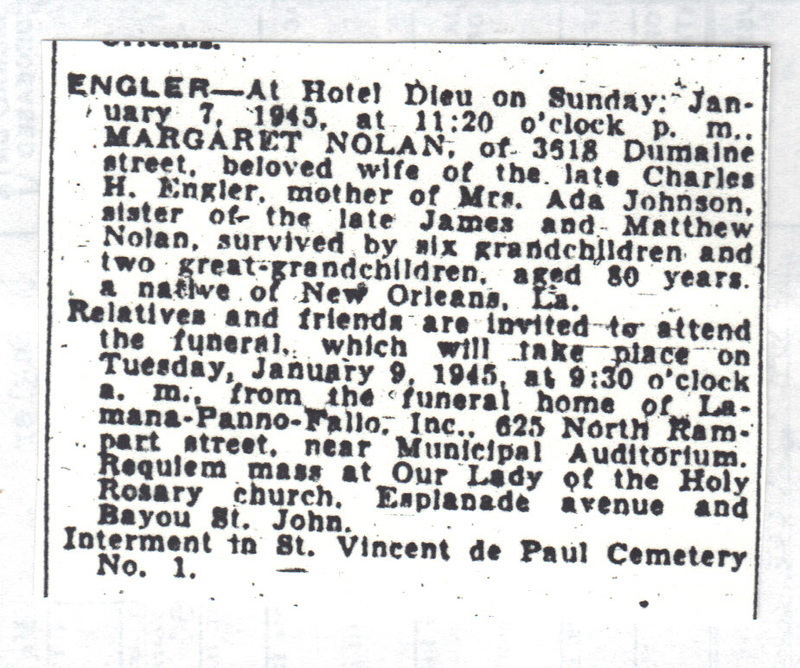 1900 Orleans Parish Census - "Maggie" Nolan is a 33 year old widowed head of household at 2462 Dauphine Street. Ada is 13. 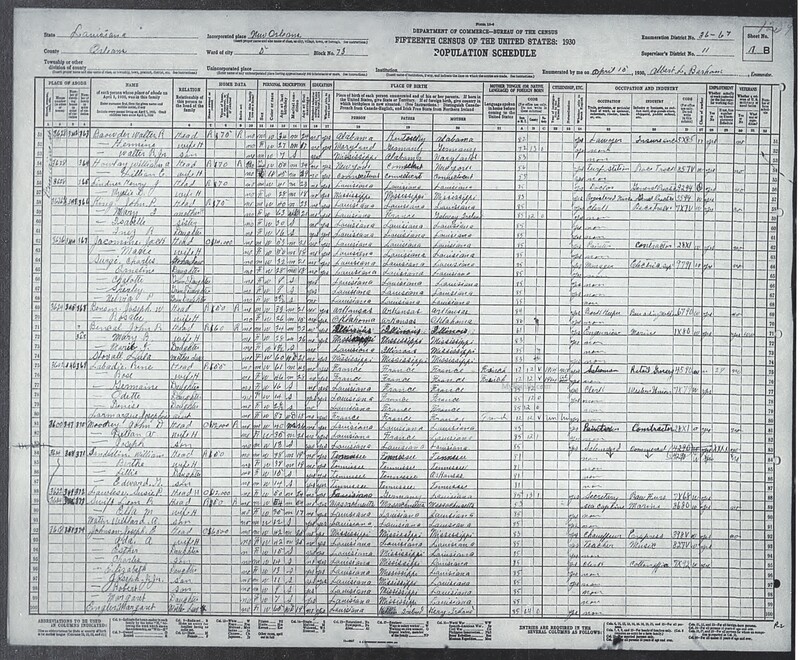 The census indicates that Maggie is a seamstress and that both her mother and father were born in Ireland. 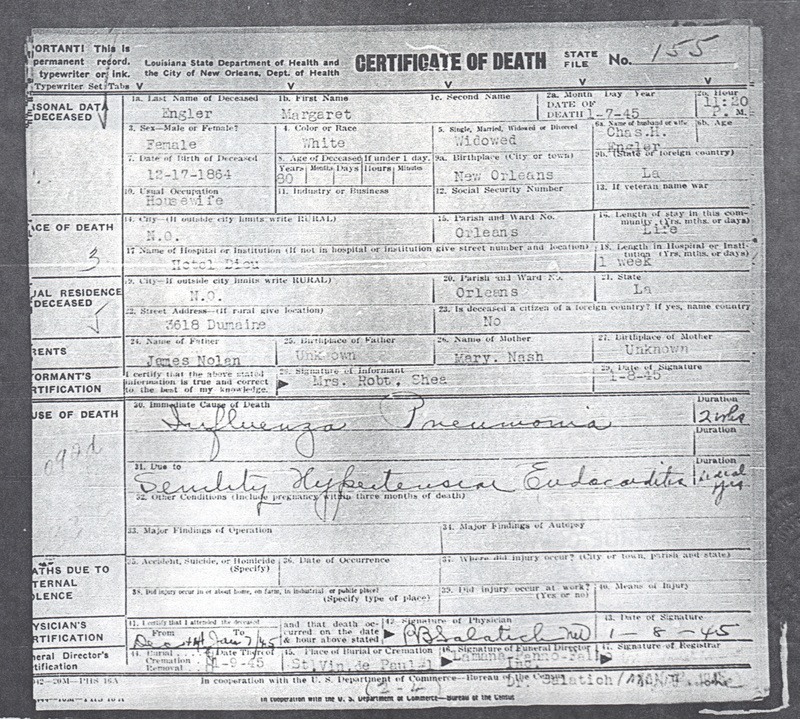 It also states that she had 3 children, only one of which was living at the time of the census. 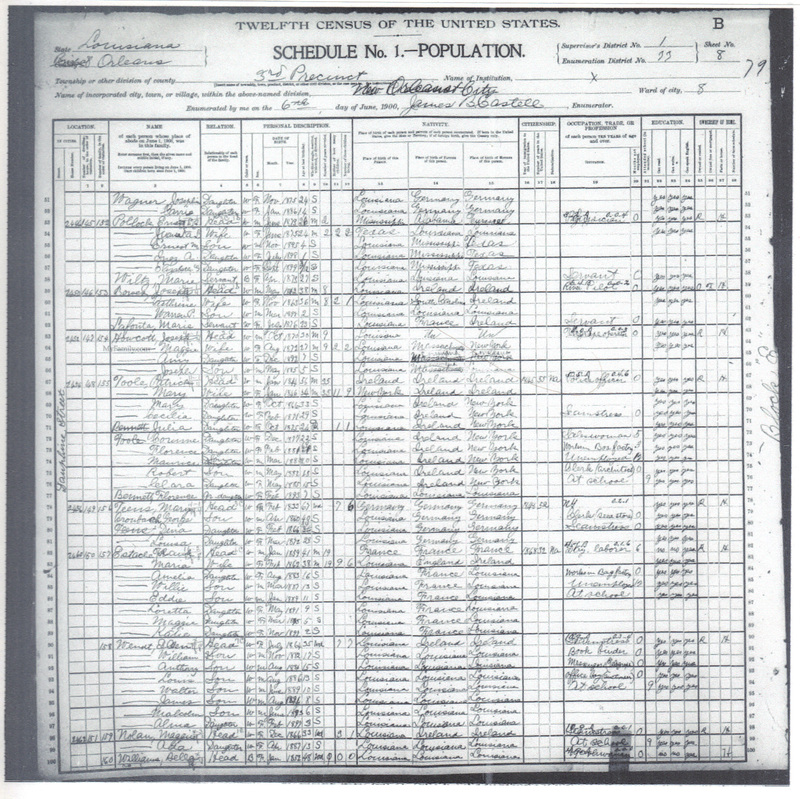 1910 Orleans Parish Census - Margaret is the 45 year old wife of Charles Engler, age 64, living at 724 Spain St. Margaret's daughter Ada, aged 22 and a piano teacher, is living with them. 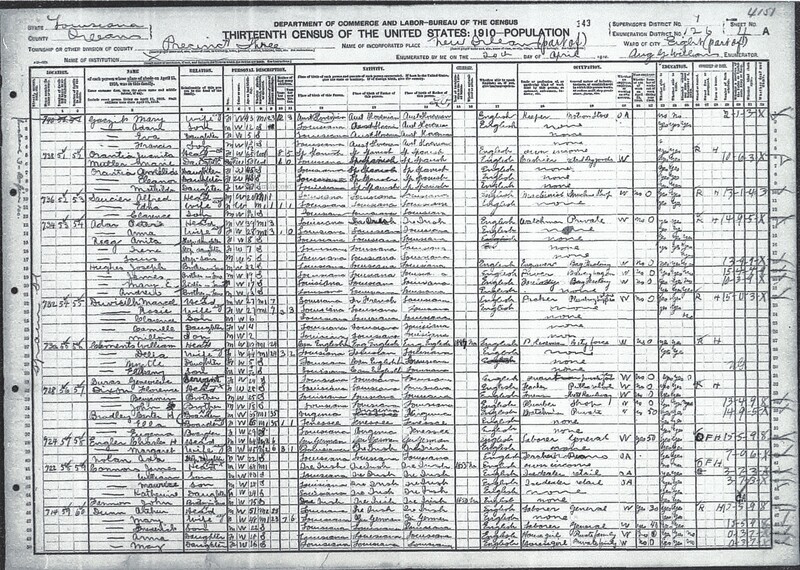 1920 Orleans Parish Census - Margaret, listed on the census as Mrs. Charles Engler, is living with her daughter's family at 1231 Dorgenois Street. 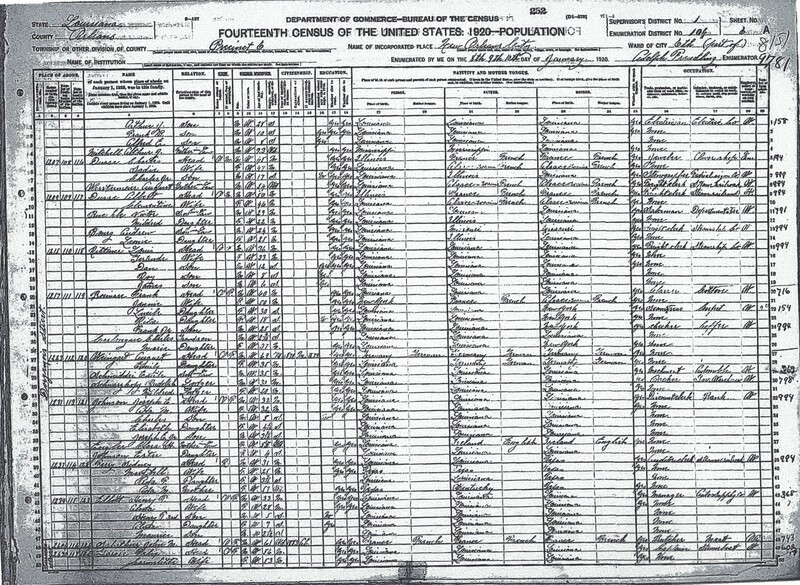 In the household are Joseph Emmitt Sr. and Ada, both 32, and their children Esther, Charles, Elizabeth and Joseph E., Jr.
1930 Orleans Parish Census - Margaret is living with her daughter's family at 3618 Dumaine Street. 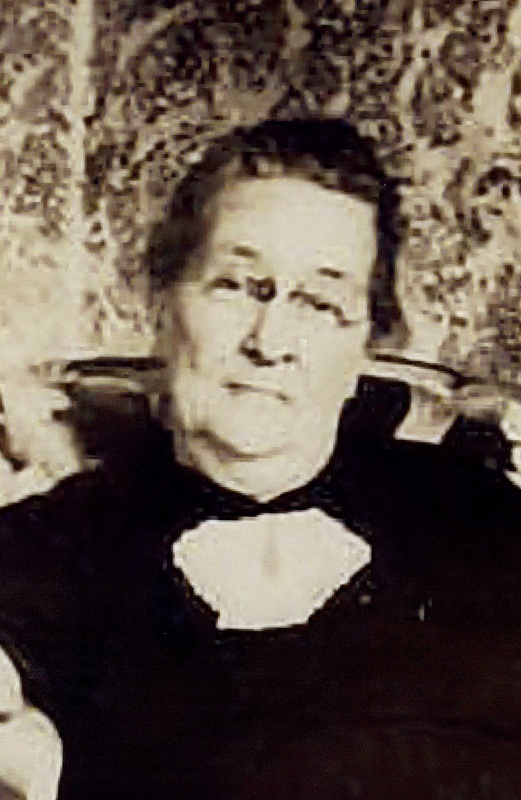 In the household are Joseph Emmitt Sr. and Ada, and their children Esther, Charles, Elizabeth, Joseph Jr., Robert and Margaret. 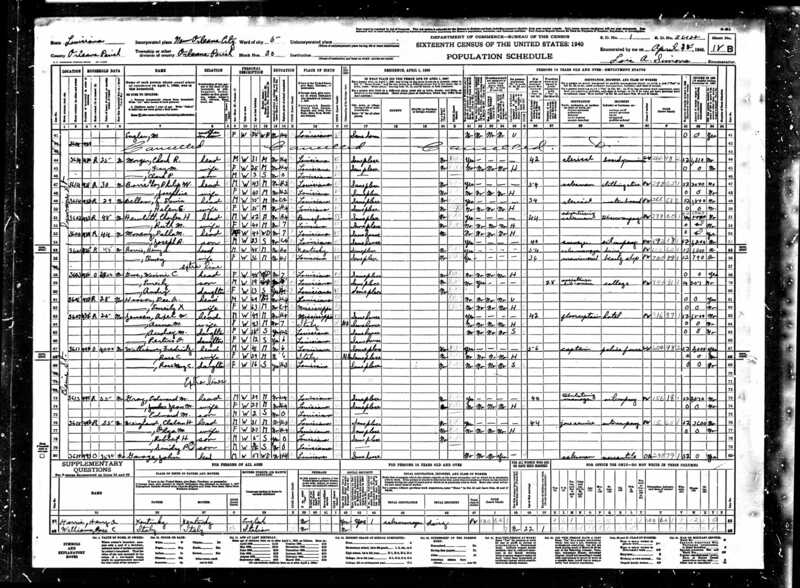 1940 Orleans Parish Census - Margaret is 75 years old and living with her daughter Ada at 3618 Dumaine Street. In the household are Esther, Charles, Emmitt and Margaret. 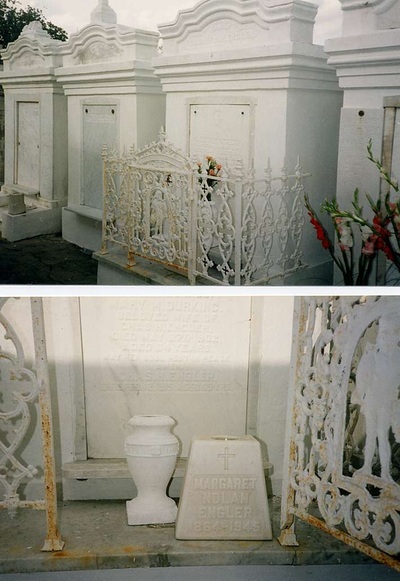 Margaret is buried in St. Vincent de Paul Cemetery # 1 along with her daughter Ada Mayfield Johnson, her husband Charles Engler, Charles' first wife Mary M. Durkin and his stepson, Hezekiah S. Jordan. Margaret's name appears on a small marker in front of the larger grave stone. Ada's name does not appear. 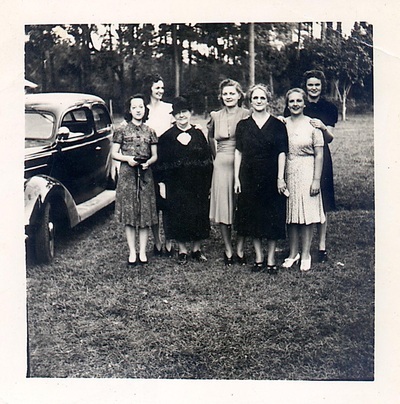 Margaret Nolan Engler - front row second from left. Daughter Ada is front row second from right. On the back row are granddaughters Margie, Esther and Bessie. 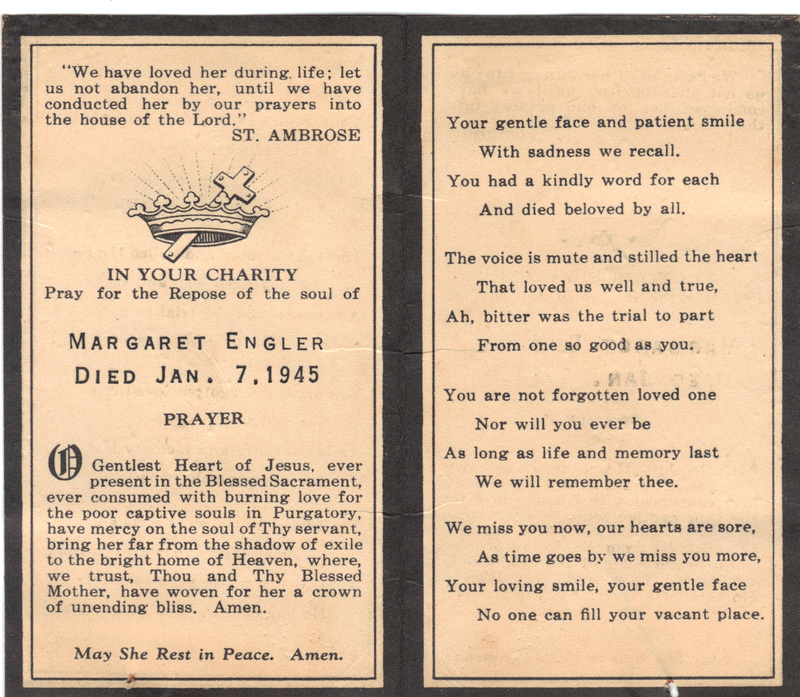 Margaret Nolan Engler's grave at St. Vincent de Paul Cemetery # 1.